Pacific Dunes has established a reputation for providing a unique golfing experience on the 18 hole championship golf course, with its natural sandy base and rolling topography, combined with temperate and year round golfing weather, it creates the perfect setting for a course to suit all golfers. The layout combines two distinct nine hole loops to create a spectacular 18 hole championship course. The opening nine holes wind through a native woodland setting, perfectly complementing the stunning wetland back nine. Designed by renowned course architect, James Wilcher you're sure to be impressed with the superior playing surfaces. 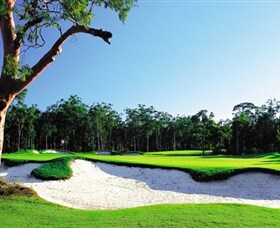 Only 20 minutes to Nelson Bay, 25 minutes to the city centre of Newcastle, and less than two hours' drive to Sydney, this magnificent premier golf and residential community will be sure to make a lasting impression. Enjoy Australia's best 'nut'urally. A family owned and operated farming and retail business, Specialising in great home made macadamia products. To complement our great products we have a cafe that offers great home style cooked meals and organic grown barista made coffee. We have a great variety off Gluten Free cakes and slices to complement our coffee and meals. Open seven days a week from 9am to 5pm.We Pride ourselves on friendly service and quality produce. The plantation has been established since 1980 and the five varieties of macadamia trees are definitely now in full production. 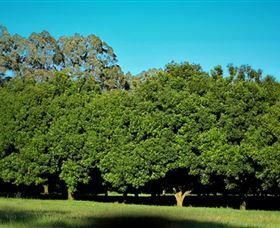 Come enjoy the tranquility while exploring one of the most Southern commercial Macadamia farms in Australia.